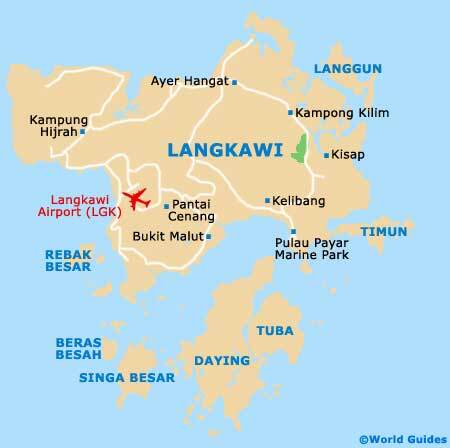 Langkawi has year-round hot weather, lying not far north of the equator and amid the warm seas of the Andaman. Its tropical, equatorial climate keeps temperatures above the 30s (°C) all year, only dipping below this at night in the cooler, dry season. Although the island has seasonal variations - a rainy season and a dry season, it rarely rains heavily for extended periods as with elsewhere in Malaysia. You could thus visit most times of the year and still get some sun. The best weather is between November and March. For virtually guaranteed sun, head for Langkawi sometime between November and June. This is officially the dry season, with lower humidity and more hours of sun. The height of the season is around Christmas time, which sees the most favourable climate by far, with crisp, clear days and cooler nights. The rainy season run from June / July to October, with increased humidity and guaranteed rain at some point. While being the low season, it rarely rains all day and is more a case of sporadic, intense afternoon showers. This is not the time for snorkelling, but is good for lower room rates.